How do I pay for the X-Shed™? Payment is easy. Once you create an account, we securely store your credit card information. Each time you place another order or an existing order renews, you will automatically be charged. Xshed does not invoice. To What location will my X-Shed™ be delivered? If using our mobile app, simply stand where you want the shed delivered and press order; our program will pick up the address automatically. If you are ordering from another location, you will be able to input the specific address along with detailed instructions where you want it placed. What if I don’t have a smart phone or App? Simply call us at 1-800-884-9743 and let us know what you need. How can I rent your X-Shed™? X-Shed™ allows anyone to set up an account with an active credit card and order right through our website, app, or over the phone. The simple answer is no. Though no is not an answer we like to give, credit card billing is the simplest way….and we are big on keeping it simple. Am I responsible for the X-Shed™ when it is in my possession? Yes, like a rental car, we require you to maintain it in the same condition as when it was delivered. Any damage will be charged to your credit card after we notify you of a claim. Can people break in to an X-Shed™? 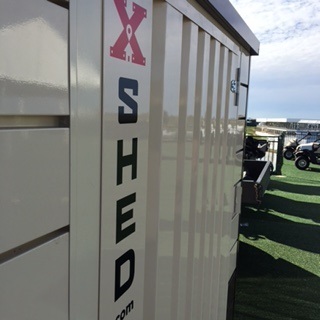 Though we feel our Xsheds™ are strong and secure, it would be hard to say nobody could break in. Our dual locked door would require some work to get through along with a lot of noise. Like most things, if someone wants in, they could find a way. Where can I place the X-Shed™? The X-Shed™ comes in 3 sizes; 7 ftx7 ft, 7 ftx10 ft,7 ftx13 ft. All Xshed’s are 7 ft high. Because the shed is assembled onsite, they can be placed anywhere you can lay the base as long as there is no overhang lower than 7 ½ ft. Our X-Sheds™ will fit under most standard patios. Are you a moving service? Not at this time. We will only pickup our X-Shed™ when it is empty. Can we move the X-Shed™ ourselves? Unfortunately we require our professionals to assemble or dissemble the X-Shed™. If you need it moved, just call us and we will help. Do we have to have a level surface? X-Shed™ works best when on a level surface, but our assembling technicians can make adjustments for uneven surfaces. We do not recommend placing an X-Shed™ on the side of a slope. Can I purchase an X-Shed™ outright? Occasionally we sell our used X-Sheds™. Call us for availability. How does an X-Shed™ do in the rain? An X-Shed™ is weather resistant, not weather proof. Though we have never seen rain enter an X-Shed™, we cannot guarantee it is not possible with enough side wind. The engineering is designed move water away from the inside of the X-Shed™. How quickly can you deliver the X-Shed™? Xsheds will be delivered within 48 hours. Need it sooner? Just call us and we will see if we can help. Do you offer commercial clients discounts? We offer discounts for rental periods longer than 6 months. Also commercial clients are guaranteed next day delivery if their order is received by 5pm.